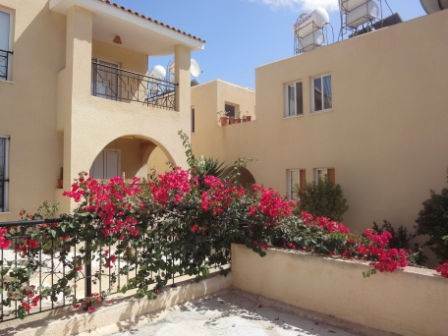 This two bedroom top floor apartment is located in the popular area of Peyia, a few minute’s drive away from the sandy beaches of Coral Bay and the beautiful Akamas Peninsula. There are a wide range of amenities in this area, including shops, restaurants, banks, pharmacy, post office and supermarkets. The project is two storey, and no walls are adjoining the apartment, making this a detached property. The accommodation features a large living area with fitted bookcases on the one side, a separate kitchen with a side opening to the living room; two double size bedrooms with fitted wardrobes, and a family bathroom. There is a good size private balcony with stunning sea views, which can be accessed via patio doors from the lounge, or from the central hallway. Also included with this property is a 12 sqm store room on the ground floor, which can easily be utilised as a third bedroom/study/workshop. The project is well maintained and has an attractive pool area with sea views, which is surrounded by colourful bougainvillea.